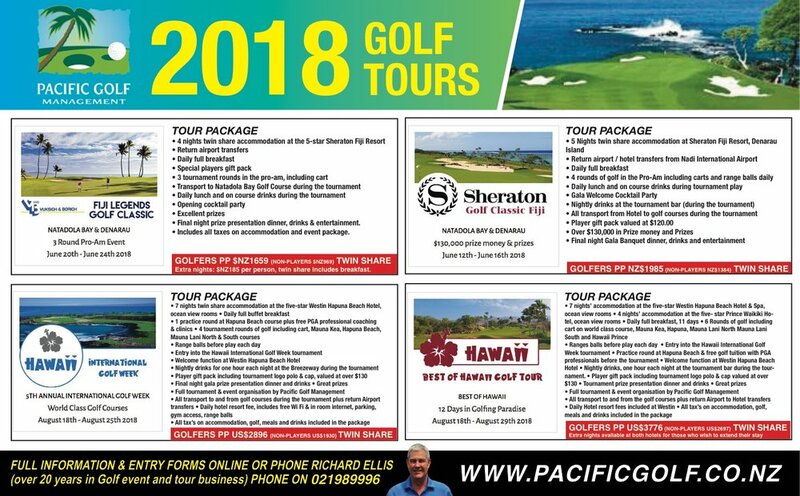 Richard has an impressive 2018 golf holiday and tournament program to Hawaii, Fiji, Vietnam, Cambodia, Thailand and the Pacific Islands. Whether you enjoy the world class resort courses and magnificent beach front hotels in Hawaii or traveling to Vietnam, Cambodia or Thailand and challenge yourself playing some of the best championship courses in Asia. Maybe closer to home would suit playing in the South Pacific’s biggest 4 round pro-am events at Natadola Bay & Denarau in Fiji with over $130,000 professional prize money and amateur prizes. You don’t have to be a great golfer to join in the fun of these tours and tournaments and there is always plenty of activates for the non-golfing partners, if you enjoy playing fantastic golf courses staying at top notch resorts and hotels and having a great time, maybe one of following tours will suit you. Go to www.pacificgolf.co.nz for a full list of tours and event information. This is the 5th annual tour and tournament to the big Island of Hawaii which is a 30-minute flight from Honolulu. Five- star accommodation for 7 nights in an ocean view room at the new Westin Hapuna Beach Hotel at the famous Mauna Kea Resort. There are two world class golf courses at the resort and another five within 15 minutes’ drive. You will love playing five rounds on the best of these amazing courses plus there’s two PGA golf pros on tour to help sharpen your skills (all included in the cost) You don’t have to be a great golf to take part as the 4-round tournament is played in different divisions for women and men, even a scratch event for the guns. It’s a great week, welcome cocktail party, nightly drinks, great prizes and fun tournament dinner to finish. For the non- golfers there are always plenty of activates, this event has sold out the last two years. Hawaii is a long way to go for just one week, so a few nights in the famous Waikiki is a must after International Golf Week, more time golfing and shopping paradise. Take a short flight back to Honolulu and spend 4 nights at the fantastic Prince Waikiki Hotel which is the only hotel in Waikiki with all ocean view rooms, enjoy a round of golf at the Hawaiian Prince course. Waikiki is also a shopping mecca with the famous Ala Moana Shopping centre only a few minutes’ walk from the hotel. The South Pacific’s biggest pro-am tournament with over $130,000 in professional prize money and amateur prizes. There are amazing individual and teams prizes for the amateurs. You will have a professional in your group for all four rounds of the tournament played at the fantastic VJ Singh designed Natadola Bay & Denarau Golf & Racquet Club. Five-star accommodation at Sheraton Fiji Resort, opening cocktail party, nightly drinks at the tournament bar, final night banquet and entertainment fantastic value for this all-inclusive package. Get in quick this event sells out every year. Opportunity for amateurs to join some of Australasia’s best senior pros for a 3-round pro-am to be played at Natadola Bay and Denarau golf courses, accommodation at Sheraton Fiji Resort, Limited space for only 40 overseas amateurs. Go to www.pacificgolf.co.nz for full information or email richard@pacificgolf.co.nz phone +64 21989996.